Graduation day is an important event on any Miss guided girl's calendar. Our hair style experts here have specially selected the very best graduation dresses and human hair extensions we have to offer to make you feel as beautiful as you are clever.Always remember that you are absolutely. Whether you want to stand out from the crowd in neon popping florals or plunge neck peplums, or simply make a classic style statement, let our selection of the best dresses around guide you to that perfect Graduation dress up. Raise your cap with pride and confidence in one of our stunning floor sweepers, saucy lace pieces, cheeky cut out cuties or luscious lace detailed lovelies. This pink mini dress will have you going from day to play with its front tie waist, long sleeves and peach hue,with a long brazilian body wave hair looks like romantic sweet and beautiful,which will make you be the centre in the crowded. Now i will introducing the most glamorous to show your body curve’s dress,it’s 2017 peace + love collection,you can match with your long straight malaysian hair weave,the showcase and structure your curves in this bodycon dress for a powerful and upscale take on your evening game.Why not? Next,this has weekend goals written all over it - featuring a midi length, lace detailing and hues of dove grey undertones,which can show your perfect curve greatly,no matter your hairstyle is indian curly or peruvian hair bundles with closure,it both would have a quite better effect. 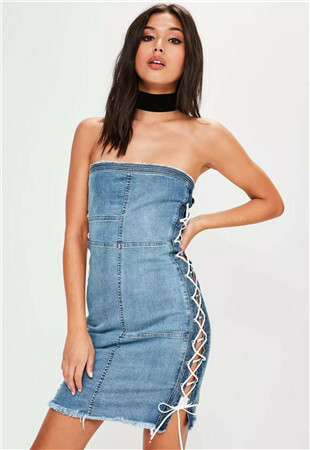 Besides,look this,embrace the lace up trend and look badass in this denim dress,wear a natural wave or loose wave could be a good choice - featuring a blue hue, lace up sides and bandeau style top. push your denim in a different direction in time for the new season. Always remember that you are absolutely.Always remember that you are absolutely unique.Be yourself,you are the best!When you can be whoever you want,whenever you want. Pls enjoy every moment in your life!Variety hairstyle,all in UNice hair. By the way,Unice hair hold Graduate Sale For you ,just keep your best moments !